Maire Curtis specialises in the application and design of hand embroidery, beading and Irish lace for weddings, christenings, confirmation, occasion wear, theatrical costume and accessories. Hand embroidery and needle lace still remain the ultimate in needlecraft embellishment and the varied techniques create infinite possibilities, unique in texture and unquestionably luxurious. A rich heritage of needle craft has passed down through the family, including many of the beautiful lace making skills which kept a generation of Irish grandmothers out of poverty when famine struck the island. My instruction began at a very early age and these skills have been applied over the years to embellishing evening and wedding gowns, creating christening robes, working on theatrical costume and much more. Living in the stunning Cumbrian Lake District provides a wealth of inspiration. The UK has a rich history of needle craft and skilled conservators all over the country have managed to preserve some fantastic pieces, giving great insight into techniques and designs dating back as far as the 10th century AD. I am fascinated by the Pagan designs brought to our shores with Viking settlers. The interwoven knots and animals became a large feature of embroidery and illuminated texts and to this day they remain the mainstay of ecclesiastical embellishment. An excellent working knowledge of period needlework allows adaptation of the traditional to blend in with contemporary clean, chic lines. Quality is our primary objective. Working bespoke items which can become family heirlooms demands only the highest grade materials and minute attention to detail, so with this in mind, materials are carefully sourced from the best manufacturers. We can provide bespoke embroidered items such as veils, stoles, bags and purses, parasols and much more. To find out more about our services please contact us in the first instance via e.mail or using the contact us link in the menu. Our diary fills quickly and due to the fact that pieces are hand crafted, it is best to give us plenty of notice. 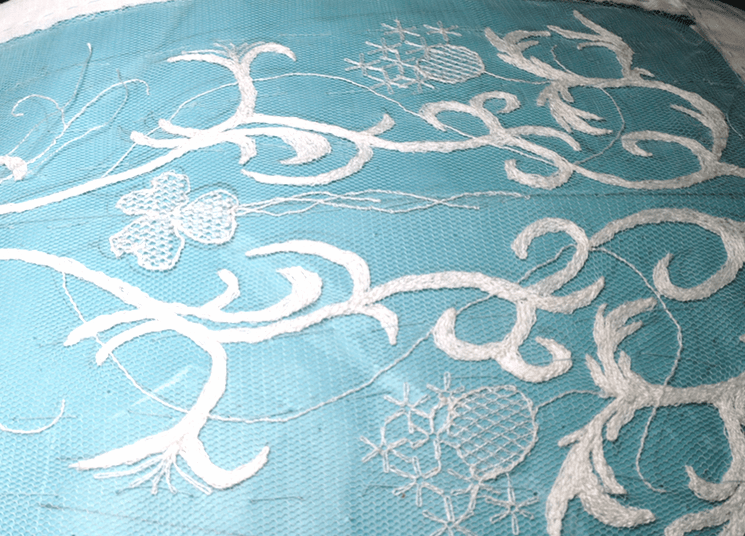 For example; an intricately embellished bespoke cathedral veil can take a year to complete.